People don’t typically associate boisterous merengue music with high-tech statistical analysis. Then again, I shouldn’t have been surprised when I heard the playful notes of a street band wafting through the window while in Guatemala with Benetech's Rights Data Analysis Group (HRDAG). You see, HRDAG is anything but a typical organization. But first: why was I, a fresh graduate of UCLA, in Guatemala in the first place? (It’s funny, my parents asked the same question.) 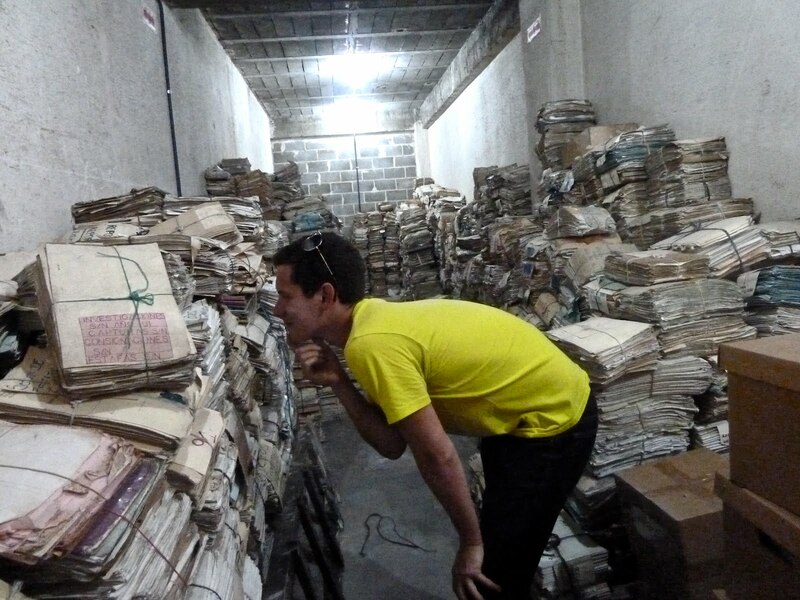 As an intern with HRDAG, I was part of the team analyzing data drawn from documents in the National Police Archive, a cache of approximately 80 million sheets of paper kept by the police system during the Guatemalan Civil War, a 36-year long conflict that ended in 1996. Our statistical analysis is being used as evidence for an upcoming trial charging former Police Chief Colonel Hector Bol de la Cruz with crimes related to the disappearance of a trade union and student leader in 1984. Last August, I traveled with HRDAG statistician Dr. Megan Price to the Archive in Guatemala City to prepare the statistical evidence with our partners. The impact that this one report could make is momentous. In October 2010, two former police officers were sentenced to 40 years in prison for this disappearance and the expert testimony of HRDAG statistician Daniel Guzmán was a key factor in the judges’ decision. The court directed the prosecutors to investigate higher up the police’s chain of command and as a result, Bol de la Cruz was arrested last June. After returning to Palo Alto, I continued to process and clean the data drawn in our latest sample of documents, which will be used to fortify our analysis for the trial. As my internship ended several weeks ago, I’ve reflected on lessons learned over the last 6 months, chief among them a sensitivity to how data gets handled and the importance of flexibility in this line of work. My HRDAG internship introduced me to the common pitfalls and mistakes that can surface in data-driven human rights research, such as selection bias and unsubstantiated generalizations. Some of these issues stem from our desire to provide the communities our research serves with immediate conclusions, even those not necessarily supported by the data; however, though its process can be drawn-out, rigorous statistical research is worth its time investment because of the heightened transparency of its methods and accuracy of its results. Indeed, much of our work in Guatemala centered on framing our partners’ substantive questions in a way we could actually answer using Archive data. Being flexible in finding new solutions was also critical to my success in the internship. On my first day in Guatemala, a freak hard-drive meltdown relegated my work laptop to a paperweight. Luckily, our partners loaned me a computer to use on the trip and despite using a new keyboard and system, I tried to not miss a beat in contributing to our expert testimony. In addition, I’ve learned alternate approaches to resolving the technical challenges that abound in statistical coding from the talented team of HRDAG statisticians I worked alongside. I’ve picked up more tricks of the trade in six months at HRDAG than I did in all of college. Aside from these valuable lessons for my future in this field, the use of principled and scientific data analysis in securing long-overdue justice for police brutality has personal significance to me. As a Ukrainian Jew, I grew up hearing stories of unfair and often-brutal police discrimination. To help stamp out such practices in another country that’s been devastated by them feels more than meaningful – it feels imperative. Being able to experience Guatemala during and after my time there with HRDAG helped me understand the effect that the service of justice could bring. When I was in Santiago Atitlán, a small lakeside village where military troops murdered 25 people in 1980, I visited a cemetery for victims of the massacre, where I met a young man who lost his family in the war. Bursting into tears as he described his memories, he exclaimed to me “Soy un guerrillero ahora” – “I am now a guerrilla.” Seeing justice brought forth, even several decades too late, could help soothe scars acquired during the war and bolster trust in the government and police for Guatemalans like him. I had to bid hasta luego to the HRDAG team and Benetech family in December but am grateful for six months of seriously hands-on work on such a unique project. While I’ve grown exponentially as a statistician and a coder, the biggest benefit has been learning from the fantastic people here. The dedication of my colleagues to find facts about human rights violations that can stand up in both the court of law and peer-reviewed academic journals has inspired me to make statistical analysis for the greater good my life pursuit. Cool story Max -- out of curiosity where did you land after your internship? Inquiring minds want to know! Please excuse this tremendously delayed response to your comment. I didn't envision any reply to this blog and so didn't check the site until now. I'm currently in Berlin, Germany, working for a geosciences research center and soon to pursue graduate school in Mathematics here. If you have any more questions, please feel free to email me at max.schneider15@gmail.com. And thanks for reading the blog!